Hello and welcome. 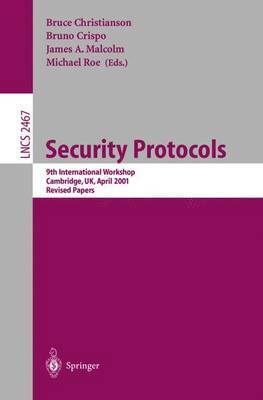 These are the proceedings of the 9th International Workshop on Security Protocols, the ?rst to be held in the new millennium. This year our theme was "mobile computing versus immobile security". As usual, the insights and challenges which emerged during the workshop are re?ected in the position papers, which appear here in rewritten form. Transcripts are also included of the discussions which took place in C- bridge as the initial versions were presented. These transcripts are intended to provide a perspective on lines of argument which are worth pursuing further. Our desire is that you will join with us in this activity, and that as a result you will, like many of our participants, feel moved to propound something quite di?erent from what you originally planned. Our thanks as always to Prof. Roger Needham, FRS and to Microsoft - search Ltd. (Cambridge) for the use of the meeting room and co?ee machine. Thanks also to Lori Klimaszewska of the University of Cambridge Computing Service for transcribing the audio tapes (and for revealing in "Audrey James" a previously unsuspected double life of a well-known double agent), and to Dr. Mary Buchanan for her assistance in editing the transcripts into a Thucydidean mould. Actually, we are often asked how we go about producing the transcripts, especially upon those occasions when, for various reasons, no audio recording was made. This year we bow to pressure and reveal the details of our methodology in the Afterword.